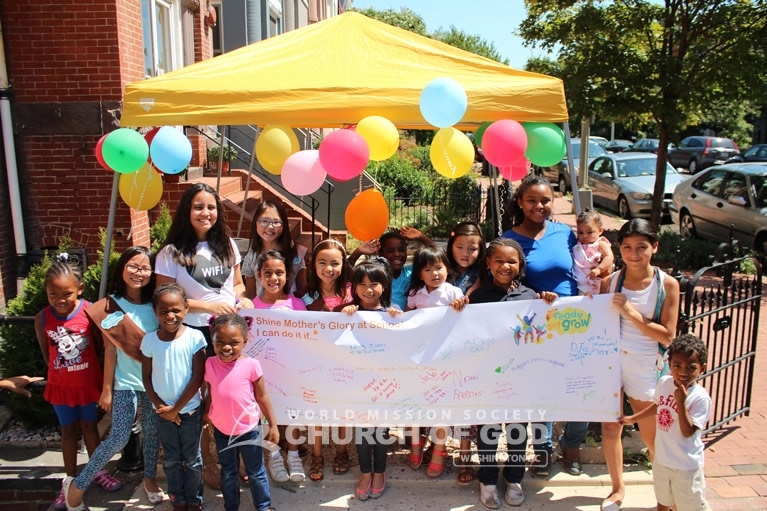 Back-to-School Encouragement Rally - World Mission Society Church of God | Washington D.C.
On August 27th, mothers from the Church of God in Washington, D.C., shared a precious time with their children. After careful planning, the group of moms surprised their elementary school age children with a back-to-school encouragement rally. They wanted to encourage their students to do their best as they look forward to the new academic year. The Church’s patio, beautifully furnished with a garden table, tents and chairs, was the perfect setting for the rally. The mothers decorated the area with colorful balloons and curly streamers. The previous night, some Church of God members volunteered to bake delicious cupcakes for the rally. And they even assembled gift bags filled with little goodies. The mothers even designed a banner with an encouraging message for the event. All the students, together with their mother, signed the banner with a pledge to do well during the new school year. These were some of the pledges the moms and children wrote on the banner. The vows were a reminder of how God’s children should behave not only at home but also in school. The moms wished for all the elementary school students to be encouraged and inspired to do their best at whatever role they play in school. They also hoped the children get good grades and strive to set good examples, following the teachings of God among their peers. Mothers were very thankful for the opportunity to do something uplifting for their children. Though small, this event encouraged all students, from the youngest to the oldest, to carry out good deeds at school. And as the new school year starts, the mothers earnestly wish their children can meet the goals they set for this year. Wow looks amazing Church of God is always giving love to the community around the world. Aww this is such a beautiful idea! If my mom did this for me I would definitely be encouraged to go to school and get great grades! 🙂 mothers are always so encouraging! This event truly shows the love of God who is encouraging and sacrificial. Nice! The Church Of God always sets a good example in encouraging others. Good job! So much love:-) It’s so beautiful seeing children being encouraged and supported. What an amazing motivator!!! We sometimes forget just how much children grow when they receive encouragement. Love it!!! In this day in age, kids need all the encouragement they can get. This is also so encouraging to the community. I hope others may see this and help as well. Good job! This is such a great idea! Not just focusing on themselves but setting time aside to show their children the right way and encourage them to be good examples in society! This is SO awesome! This warms my heart to see an event like this to encourage children to do their best in school. Encouraging words from parents have such a great impact on their child’s motivation to succeed. Keep up the good work Church of God! I am so happy to know that there is an organization that cares about the growth of our children in Washington DC. It is very important that parents are part of that encouragement, which isn’t seen in every day life anymore. Through this event both the parents and the children are encouraged. Good job! Amazing! The people of the Church of God always set a great example of God’s love, even their children set a great example too! This church is truly a gift from God, so much consideration and love is found in The Church of God! I hope they do this event again! Wow this looks like so much fun! Great job at all the parents and the Church of God for such an uplifting event. That’s so cute! I’m glad there is a church that’s stepping forward and helping kids be excited for school! Wow!! What a great way to inspire the next generation in Washington, DC! What a happy group! Encouragement from the Church of God along with their mothers made this a special time for all concerned. Great idea. Great work World Mission Society Church of God for caring about the youth and enstilling them a sense of duty and responsibility. This is a great idea to encourage children in school. I am so moved. The Church of God is truly amazing. Wow! This is a beautiful display of putting God’s words into action. I know each child and mom is continuing to fulfill their pledge for succes in school and their community. Great job! Wow i been following church of God for sometime. It seens Alot of their activities are quite amazing. Even the kids there show a reflection of their parents of the Church of God. GREAT JOB!! What a great way to go back to school. This is very touching! It’s beautiful to see that even children have a heart to spread love. Truly amazing! This is soooo beautiful! The kids look so happy and I’m sure the Mother’s were even happier to see their children pledge to make good grades and be good examples. That’s always a parent’s wish. Hope they can do it again! This is so touching. It’s amazing to see how much love the members have at the Church of God. They are always setting an example. How cute this is! It’s great to see parents and children working together to strive to do their best. It has been proven that when the children receive love and support from their parents they thrive. In such a loveless world this is exactly what is needed! Great job Church of God! So adorable and so encouraging!! The Church of God members always take meaningful and touching initiatives to cheer up the community. They set a great example for the rest. God is pleased with them. Great job!!! This is so amazing! It’s great to see that the moms really wanted to encourage their children to be great examples and to do well in school. I believe through this the children can truly sse their mom’s will for them to be wonderful students! Wow such a thoughtful event to encourage students. Church of God is always hosting unique events for all. Such a great idea for the mom’s who love their children and want to encourage them! What a great Church! Many should follow their example! What a precious site! It’s so wondeful to see such love in a church. Children are our future and the Church of God is definitely displaying that by cultivating the love of God into the character of the children. I remember being there. The children and moms were so happy and united. What a great place to raise your children! How cute!!! The little children look so happy. I believe this was such a great idea for mom’s to encourage their children to do well in school. The Church of God really does think of even the smallest things to make a big encouragement ! Wow, what a creative way to encourage the youth! The Church of God really concerns for everyone no matter the age, what a great example in the community! Truly this Church has such a positive impact in the lives of children. They are encouraged to set goals in school which motivate them to be better citizens, just like the Bible asks us to be. Keep inspiring future generations.